To say that corruption under Goodluck Jonathan exceeded epidemic level is an understatement. Under Jonathan’s Presidency, we witnessed an unprecedented level of reckless acts of corruption. It was thus not surprising that a 72-year-old former dictator-General Muhamadu Buhari (GMB)- capitalized on this singular factor to win a historic presidential election with the slogan of change. You can now understand why those of us that voted for the General way back in 2003 (knowing fully well that he was not going to win) are tickled with this victory. Though we are thrilled, we are also cautiously optimistic, conscious of the fact that tackling corruption in this present Nigeria is a tall order. However, we are confident that the right steps can and should be taken to reduce it significantly. Here are a few fundamental ideas that if implemented, can by their very nature, curb corruption. personal character and leadership by example which we have in GMB. The second crucial element is the need to set example to deter will be offenders from engaging in corrupt acts. And what better way is there to do that than sending the symbol of corruption in Nigeria in the past 4 years- Diezani – to prison. Below are ten good reasons why the beautiful bride and amazon of corruption in Jonathan’s administration – Diezani – must go to prison. 1.) 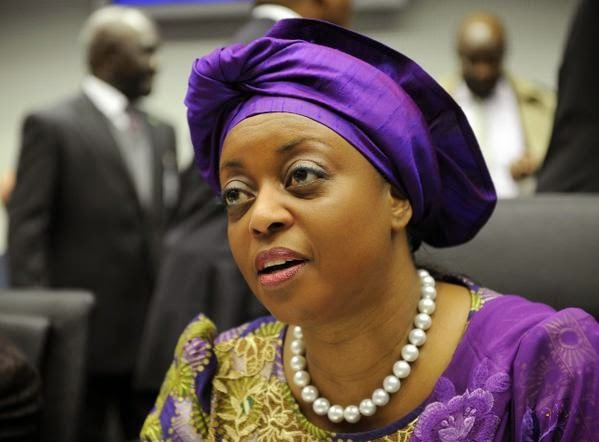 For the light of the fight against corruption to be turned on in the dark alleys of NNPC and the “fake” deregulation of the downstream oil sector aka “oil subsidy”, Diezani Alison-Madueke MUST go to prison. Releasing the $20 billion audit report will not only send Diezani to prison but will also expose the public officials behind the unaccounted SURE-P’s N1.8 trillion and send them to prison as well. Also, sending Diezani to prison means that Femi Otedola and Farouk Lawan can be made to account for the over $3m fuel scam ‘bribe’. 2.) Diezani MUST also go to prison so that the likes of Tinubu and Rotimi Amaechi and all the crooks in APC that sponsored Buhari’s campaign can be made to account for their stewardship in public office. Sending Diezani to prison will also deter them from engaging id corrupt acts under GMB. 5.) Diezani MUST go to prison so that Nigerian Police Force, Immigrations, Customs and SSS can be reformed. Marilyn Ogar, the spokesperson for Nigeria’s secret police must be punished for the N15 million worth of kerosene she got from PPMC for going after the opposition APC. Mind you, this is not witch-hunting, but the only way the Police IG under Buhari can be discouraged form allowing him/her self to be used by politicians against perceived PDP “trouble makers”. 7.) Diezani MUST go to prison so that Stella Oduah can go to prison over the purchase of N225 million naira bulletproof car. The report on that scandal should also be made public so that the conspirators and collaborators in the aviation ministry and Coscharis can also go to prison. 8.) Diezani MUST go to prison so that dirty deals in the oil sector exposed by the Ribadu Report in 2012 but quickly buried by the corrupt administration of Goodluck Jonathan can be resurrected and offenders severely punished. 10.) Diezani MUST go to prison so that the cases of former governors (now distinguished senators) that has been ongoing for “eternity” can be expedited and offenders convicted and jailed. ICCP, EFCC, or whatever name(s) they are given should be re-organization and re-engineering as a matter of urgency. Our courts have been sending petty thieves to jail every day. So, it’s not a case of judicial system. Rather, it is a case of corrupt Chief Judges, Attorney General, and judges bribed to stupor that they turn a blind eye. What is called for now is radical reform of our judiciary by appointment of judicial activists with the integrity, clean hands and guts to send their colleagues to prison for aiding corrupt public officials. That in my interpretation of the change Nigerians voted for. Talking about keeping the government clean, I learned from the Singapore experience that it is easy to start off with moral standards, strong conviction and determination to bid down corruption. But it is difficult to live to these good intentions unless the leaders are strong and determined enough to deal with all transgressors and without exception. Tinubu and Rotimi Amaechi in particular MUST therefore, not be spared. Finally, my message to the GMB is that we the people are watching his actions and inactions as he starts the difficult journey of delivering the much needed change. The fight against corruption should be hit by an earthquake-like jerk. A group of activist prosecutors with proven record of sending the corrupt to prison must be assembled to go after the symbols of corruption in NNPC, Ministries, Nigerian Customs, Internal Revenue, Ports, and Governors etc. Heads must be made to roll. That is the only way to mark the true beginning of the beginning in the fight against corruption in Nigeria. PreviousFinally! Keshi returns as Super Eagles manager. NextXenophobic attacks: South African President to meet with foreign nationals.